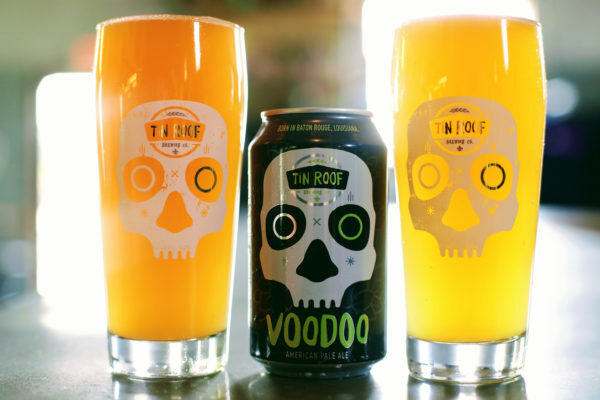 About a year ago we released a re-imagined take on our old friend Voodoo (Bengal); one that incorporated our evolving affinity for the hazy and juicy beers we were enjoying so much from our local brewer friends, and breweries all over the country. Haze was clearly here to stay, and it seemed foolish for our beer to not evolve along with our collective palates as well as the local market. Fast forward 15 months and the Voodoo reformulation has been a substantial success for Tin Roof. And yet, we felt we could, and more importantly, should take it just a little bit further. Rather than treading water, we have opted to dive deeper into the haze, replacing our house yeast with a strain built specifically to accentuate the juice. This change will affect all of our non-sour beers, though none quite as much as Voodoo. Essentially it will bring out more of the juicy flavors we’re all craving, without changing the essential character of our beer. In addition to the yeast change, we made a few adjustments to the Voodoo recipe, including replacing the malted wheat with flaked wheat, (to further lighten the color and increase body/mouth feel), and adjusting the hopping schedule to focus more on dry hopping (to slightly reduce bitterness and increase hop aroma and flavor). The net result is a beer that still tastes like and drinks like Voodoo, but is undoubtedly a more vibrant flavor experience. In the photo, the new new Voodoo is on the right. There have been some small adjustments to Juke Joint as well, with a similar net result; the beer is more vibrant, with just a bit more citrus and tropical fruit hop flavor and aroma, but still retains its essential character. All packages dated 6/15 and later will have the new yeast, and the recipe adjustments, and hopefully most markets either already have those packages on the shelf, or will very soon. Please let us know what you think, and as always, thank you for your support!! !